Ramadan, Van Salee, and ancestry. Inspired by Strawberry Singh and Helen Boyd. I'm a member of an online transcommunity run by author Helen Boyd. I've been a member of that community for 11 years, the only online community I've followed longer is Slashdot. Yes, I know...Slashdot. /me shakes head sadly at my own nerdosity. Last week Helen did a post about Ramadan's History in America. Which is a VERY long history, much longer than most modern American's think. Upon seeing that post one of my first thoughts was ... "Berry's going to be doing her annual Ramadan post soon." Which she did, the next day. It also reminded me of my own small connection to Islam in America. It might be surprising to some, but yes, I do have one. While as my readers, acquaintances and friends know, I'm mostly of Celtic ancestry on both my mother's and father's side, but that's not all my ancestry. I'm descended from one of the first Muslim settlers in the New World, in New Amsterdam aka New York City, actually. And his Q'uran is the oldest known Q'uran in America. To those who know their history those facts alone are enough to identify him, Anthony Janszoon Van Salee. Yes, that means I have Moroccan ancestry. And yes, that also means I'm descended from the woman variously described as Manhattans first "lady of the night" or "The Carrie Bradshaw of Colonial America", Grietse Reyniers. So inspired by Berry, and my ancestry I decided to do a post with some "ethnic" clothing. First I did some googling about women's clothing and fashion in Morocco, and after seeing some pictures decided to try to find a kaftan, which I did. Then I was thinking that perhaps I should search Berry's Blog for a "less pale" skin, but while I was looking through more pictures of Moroccan fashion I found a woman that made me go "squee" and say to myself. "I guess I really don't have to change my skin...or my hair color." Who is an awesome redheaded fashionista-princess-engineer with REALLY nice shoes. She knew she had it "goin on" there. Google her, she's fabulous. Yes, she's ethnically Moroccan, there are redheads among the Berbers. The kaftan I found was the Bilo Rani "Sabah", as it turns out, Berry wore it back in 2013. The girl always has the scoop, she's the Berry! I wore it in green because there was a famous utterly fabulous green kaftan that Lalla Salma wore and redheads look good in green. Sadly, this kaftan shows more cleavage than I wanted, but I like it anyway. Belleza Betty skin, Hucci Jacmel pumps. As you can tell, those are not my usual green eyes, but brown ones. Ikon "Charm" eyes in Chocolate. Since I was wearing the Maharani set, I went ahead and put on the nose chain, the mang tikka, and the Zaara Chandni Lehenga in Scarlet, to take some pictures of the full set and the Chandni, which I've had for a while. Might as well go full on Berry-clone, except for the paleness. I adore the Chandni in this color. While I adore it, and think it's beautiful, I probably won't pick up the other colors as much as I might want to. 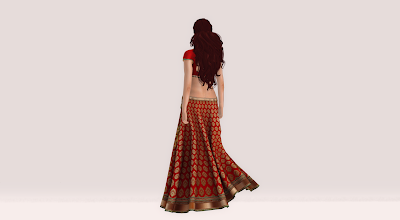 Pale Celtic redheads, even those with Moroccan ancestors, probably shouldn't be wearing lehenga's too often. Truth Sally hair, which always reminds me of one of the hairstyles of Mad Men's Sally Draper. CC McCrankypants: Serious issues with the Client. I'm having serious issues with the current client I'm using, 3.7.28 "Obsolete platforms" viewer even worse than the 3.8.0 series. I had to switch to that one because somehow LL messed up the most recent builds of other projects so that they don't run on Linux. I don't know how they were able to get them to build and run on their test system when they don't run on actual Linux systems in the wild. Maybe because they're STILL USING a 32-bit Linux for building the Linux client in 2015! Anyway, you might not see me in-world as much, or as long, since I'm crashing more, ESPECIALLY when TPing a lot or trying to attend shopping events. Just a quick post here. I went shopping for a new dress to wear to that Linden Party for Premium residents, I wanted something summery but fashionista-y and well, I wanted to be the best dressed Fashionista there. I knew of one dress I thought would be good, but looked around a bit at some others before I bought it. I would have eventually bought it anyway. I so loved that neologism that I had to blog the word, and the gown. This is the Persephone gown from Dead Dollz available at the Secret Affair. An elegant gown with black halter and waist banding, that shows quite a bit of skin at the hip area. But it's still classy and not so much skin that it makes it non-classy. Sexuregal!©®™ I also bought the all black version. Each is L$300. I paired it with an older Amacci updo, Carol, which works well with the Angsa hat from Schadenfreude. That hat is currently one of my favorite hats in SL since you have 3 color options for the hat itself and several options for the band and bow. There's also an option for long flutter tails with the bow and a bowless option. I love this hat, it appeals to my love of the Blessed Audrey. That is the Paradigm jewelry set from Amorous, I've worn it before on the blog. Skin and eyes are my usual Belleza Betty and IKON Lucid eyes in Moor.